The first monthly draw for DiamondXtraseason 10 holds on Friday, March 9th, 2018. This draw will reward 10 customers with ₦1,000,000 each while one lucky customer will win the star prize of Salary4Life. Winning Salary4Life means that the customer will have no need to worry about income for the next 20 years as Diamond Bank will pay the lucky star prize winner ₦100,000 every month for the next 20 years. 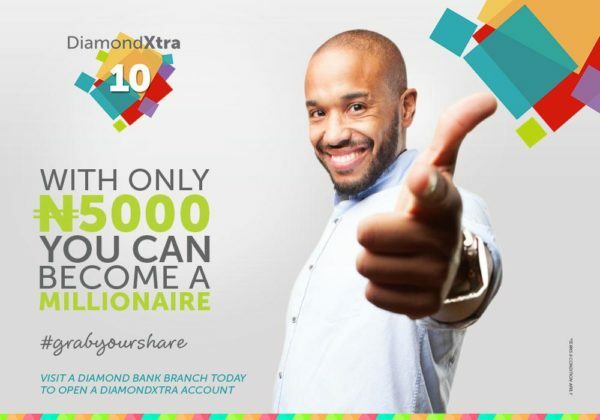 Customers who have saved a minimum of ₦5000 in their DiamondXtra account stand the chance to win either ₦1,000,000 or Salary4Life. The more multiples of ₦5000 a customer saves, the higher the chances of winning. In the last 9 seasons of DiamondXtra, over ₦5,000,000,000 have been given out in rewards and over 11,000 lives have been positively impacted. The continuous effort of Diamond Bank in improving lives and empowering Nigerians with resources is more evident as season 10 promises 21% more in the number of winners than last season. Over 4,950 customers will be rewarded with various prizes. Some of the rewards include 10 millionaires every month, special reward draws for women, brand new cars, 5 years education allowance (Winner gets N100,000 every month for 5 years), 1-year rent allowance, Gem points, and Salary4Life to mention a few. DiamondXtra customers are eminently expectant as everyone is excited to know who will be among the first set of winners this season. 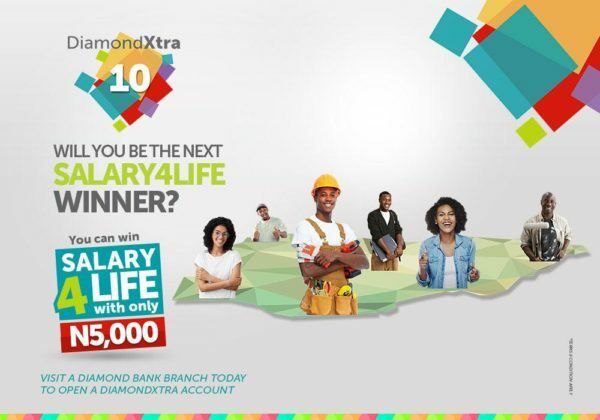 In the next few days, the winners of ₦1,000,000 and Salary4Life will emerge, only customers who have a DiamondXtra account and have saved a minimum of ₦5000 can qualify. 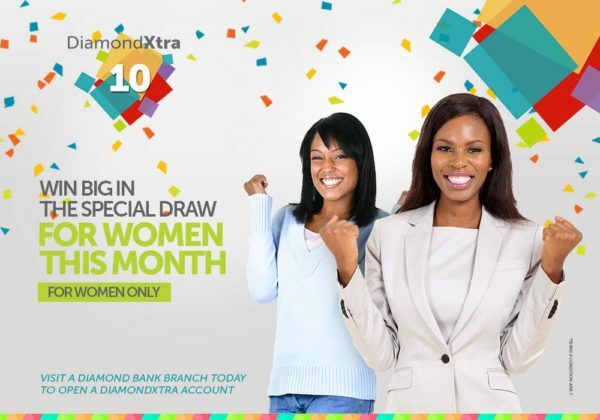 In addition, Diamond Bank celebrates women all year round but in the month of March being Women’s History Month, a special draw would hold for female customers only. Women are advised to take the most advantage of this opportunity as it is not too late to save to be a winner. Every ₦5,000 saved increases the customers chance of winning as each N5,000 saved gives the customer a ticket in the electronic draws. Existing customers: Just increase your DiamondXtra account balance. Every N5,000 in the account gives the customer a ticket into the draws and the more ticket a customer has, the more his chances of winning. New customers: Visit any Diamond Bank branch, open a DiamondXtra account with a minimum of ₦5, 000 and start saving. Every N5,000 in the account gives the customer a ticket into the draws and the more ticket a customer has, the more his chances of winning. Visit the nearest Diamond Bank branch or click goo.gl/9Y3UyP to get started.